VATICAN CITY (CNS) — Baptism requires rejecting Satan and professing one’s full faith in God, Pope Francis said. Only by being able to say “no” to the devil, his works and empty promises “am I able to say ‘yes’ to God, who calls me to conform myself to him in thoughts and deeds,” he said. 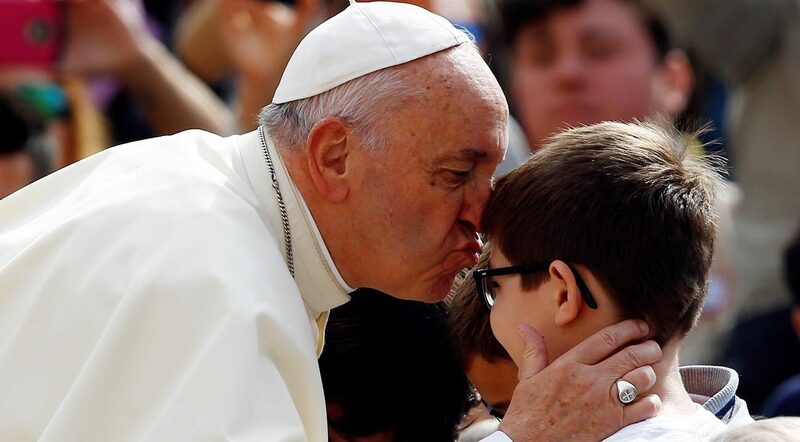 “It is not possible to follow Christ (while) imposing preconditions,” he said May 2 during his weekly general audience in St. Peter’s Square. Continuing his series of talks on the sacrament of baptism, the pope looked at the importance of the heart being ready to receive the gift of new life from God through the baptismal water and the Holy Spirit. When a child is presented for baptism, its parents and godparents renew the vows of their own baptism in rejecting sin and professing faith in Jesus. One must break with the past and its sinful attachments, “leaving them behind in order to embark on the new way, which is Christ” and to be able to “truly embrace others,” he said. “The devil divides and God always unites the community, the people” in one body, he said. During the baptismal rite, he said, the individual is asked to respond in the first person, to reject evil and profess his or her faith as a sign of choosing to be personally responsible in this daily commitment of trusting in God and walking with him. The profession of faith reflects a commitment — aided by baptism — to be strong and persevere throughout all of life’s trials and temptations, he added. “Rejecting sin, the temptations of evil, Satan — the source and cause of every sin — and faith in what the church believes” are not temporary or provisional commitments asked only at baptism, Pope Francis said. They are required throughout life, he said, and “the presence of the Holy Spirit will give you the strength to fight well” against evil and temptation. Whenever people bless themselves with holy water, he said, they should recall with joy and gratitude the gift they received on the day of their baptism and they ask for the grace to persevere and live “immersed” in God’s love.